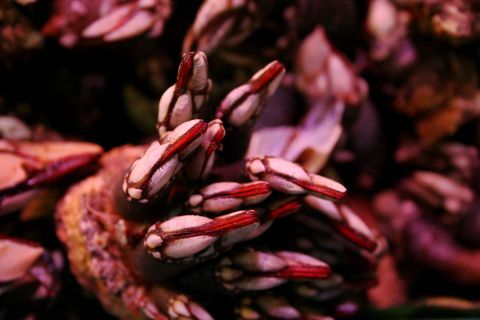 The percebe is a delicious, edible gooseneck barnacle. Seafood lovers proclaim the succulent lusciousness of its slippery, slurpable innards make percebes earth’s best-tasting seafood. It didn’t sound very appealing to me, and I did not know what a barnacle was anyway. You know, when English is not your first language, barnacle is not a word that’s likely to show up in a casual conversation or in your ESL classes. Of course, I then googled barnacle and found that it was simply what in Brazilian Portuguese is known as craca. My immediate reaction was: What???!!! 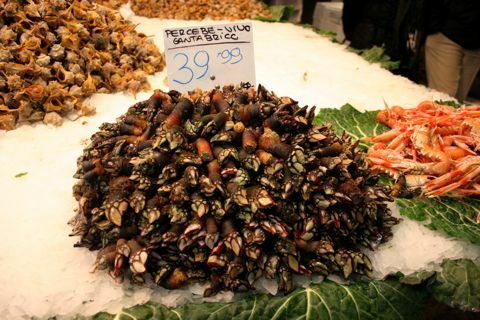 Some people eat cracas and say that’s the best-tasting seafood on the planet? It’s like my mother saying the best part of the chicken is the neck. (I never actually tried it, but I still don’t believe her). All this googleness finally paid off, as it led me to find by accident that barnacles played a pivotal role in Darwin’s breakthrough evolutionary theory, as described in the book Darwin and the Barnacle (by the way, Google Book Search rocks!). According to Wikipedia, Darwin was the first to fully study and classify barnacles. No surprise there. I used to tease a friend of mine for studying the behaviour of sea urchins (well, they basically don’t do much of what regular folks call behaviour), but barnacles are even worse, as most of them spend their lives cemented to a rock and barely move. If I were to choose a species to describe, barnacles would probably be very low in my list. What is really interesting in this story was that it took Darwin more than 20 years between formulating his theory and publishing it. He was a 50-year-old man when he finally published The Origin of Species. Contrary to Thomas Edison, who seemed to come up with new things every 5 minutes (come on, 1,093 patents in his name? ), Darwin had one major innovative idea, and it took him almost a lifetime to develop it. But when he finally published it, it changed the whole history of life sciences. I am not apt to follow blindly the lead of other men. I have steadily endeavoured to keep my mind free, so as to give up any hypothesis, however much beloved (and I cannot resist forming one on every subject) as soon as facts are shown to be opposed to it. He wrote that late in his life, and it’s refreshing to see that even after all his accomplishments, he was still keeping an open stance and an inquiring mind. How’s that for a role model? Excellent posting.I felt the same reassuring message when I learned about Victor Hugo being 60 years old when he wrote Les Miserables. As for ‘barnacle’, I wouldn’t have known what they were if it was not for their weaponized appearance in HalfLife. I wouldn’t want to eat those. Thanks Denilson. The HalfLife reference is interesting: can’t believe barnacles made all the way to pop culture. I did not know about the Victor Hugo factoid: I remember being 7 or 8, watching one of those TV shows about Mozart’s life and learning he composed his first musical pieces at the age of 5. I thought: “I’m already 7 ( or 8 ) and have not done anything yet”. Well, you’ve just given me a little more of a breathing room with that VH info.